Addresses the Sesquicentennial Celebrations of the High Court of Judicature of Allahabad in Lucknow. 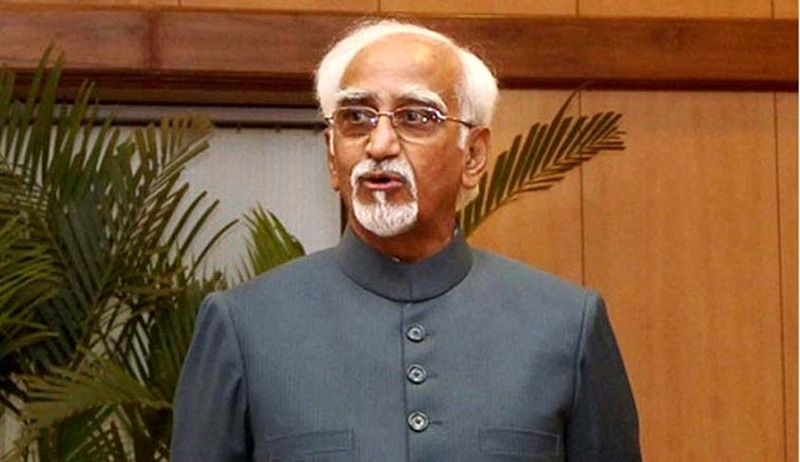 The Vice President of India, Shri M. Hamid Ansari has said that the burden of delivery of Rule of Law falls on the judges. He was addressing the Sesquicentennial Celebrations of the High Court of Judicature of Allahabad, in Lucknow today. The Governor of Uttar Pradesh, Shri Ram Naik, the Chief Justice of Allahabad High Court, Dr. Justice D.Y. Chandrachud and other dignitaries were present on the occasion. The Vice President said that the traditional public esteem for the judiciary has been reinforced by its activism in contrast to the failure of the executive to apply correctives on matters of concern and this is particularly true of its good work in expanding the ambit of rights. The Vice President, however, also cautioned that lack of access to justice, the high cost of it, delays in the delivery of justice, lack of a mechanism for accountability and allegations of corruption have, together, given rise to doubts and added to the pervasive pessimism about the efficacy of institutions. He further added that another area of concern is the excessive zeal reflected at times in pronouncements of members of the judiciary. Referring to Kautilya’s Arthashastra, the Vice President said that judges shall discharge their duties objectively and impartially and added that rectitude is thus a prime requirement in judiciary as in all other walks of life and must be observed at all times and at all levels. The Vice President said that a changing world has made globalization an unavoidable necessity and this, in the ultimate analysis, cannot be restricted to economics and trade policy only and extends to global standards in all fields including in the area of dispensation of justice; by implication, the space for local peculiarities is shrinking. The sooner we adjust to it, the better for all – litigants, lawyers, judges and the eventual beneficiary would be public, he added. “Men and women who wear judicial robes are not known to deviate into the unknown and yet they seem to have embarked on a risky venture in inviting someone unlettered in law to this landmark function today marking the sesquicentennial of the High Court of Allahabad. I thank Chief Justice Chandrachud and Mr. Justice Husnain for this and I fervently pray that I would justify their gamble. The Allahabad High Court of Judicature is one of the oldest high courts in the country. Today, it is the biggest in terms of work load, the number of judges and, regrettably, in terms of vacancies on the bench. The Lucknow Bench of High Court itself has had a long and distinguished history. I have a subjective reason too for succumbing to the temptation. A distant relation of mine on my mother’s side was the first Indian Chief Justice of the Allahabad High Court. I refer to Sir Shah Mohammad Sulaiman who presided over this Court from 1932 to 1937 before becoming a judge of the Federal Court of India established under the Government of India Act, 1935. The eloquent tribute paid to him in Justice R.S. Pathak’s essay in the centenary volume is testimony enough to his work. Over time and in different societies, these principles have been challenged, amplified and modified. Professor Upendra Baxi has sought to read the rule of law as going beyond a mere division of functions in modes of governance; to him, it is the rule of good law and is as such reflective of the struggle of a people ‘to make power accountable, governance just, and state ethical’. Professor Baxi opines that the Indian constitutional conception of the rule of law links its four core notions: rights, development, governance and justice. ‘a dynamic concept for the expansion and fulfillment of which jurists are primarily responsible and which should be employed not only to safeguard and advance civil and political rights of individuals in a free society, but also to establish social, economic, educational and cultural conditions under which his legitimate aspirations and dignity may be realised’. This approach has been upheld in judicial pronouncements. Rule of Law, said the Supreme Court in Dalmia Cement (Bharat) Ltd v Union of India (1996) ‘is a potent instrument of social justice to bring about equality in result’. It is here that the burden of delivery falls on the judges. The traditional public esteem for the judiciary has been reinforced by its activism in contrast to the failure of the executive to apply correctives on matters of concern. This is particularly true of its good work in expanding the ambit of rights. On the other hand, lack of access to justice, the high cost of it, delays in the delivery of justice, lack of a mechanism for accountability and allegations of corruption have, together, given rise to doubts and added to the pervasive pessimism about the efficacy of institutions. One law officer has also expressed concern over the ‘increasing disregard of the salutary doctrine of precedents’. What then is the score on this count? Some years back the longest serving Chief Justice of India dwelt on a few aspects of the matter on the eve of his retirement. In response to a question about delay, he identified long judgments, frequent adjournments, and lengthy oral arguments. Each of these, let me add, is remediable and can be remedied given the will and the commitment on the part of the judiciary and the fraternity of lawyers. Judgments in an earlier generation were concise and cryptic and adjournments were allowed only for good reason. As for long oral arguments, it is an Indian malaise; in the Supreme Court of the United States, for instance, each side is allowed only 30 minutes for oral presentation. There is no reason why verbosity cannot be restrained. The ‘desire for immortality through the pages of law reports’ can be achieved better through sharp and succinct pronouncements, as was done in an earlier period and has been done by great judges the world over. This brings us to the question of social awareness particularly in a society like ours with all its complexities and imperatives. The answer here would lie in the letter and spirit of the Constitution and in the expectations and aspirations of the citizens and their quest for justice, liberty, equality and fraternity. A court which yields to popular will thereby licenses itself to practice despotism for there can be no assurance that it will not on another occasion indulge its own will. Courts can fulfill their responsibility in a democratic society only to the extent they succeed in shaping their judgment by rational standards, and rational standards are both impersonal and communicable. This should throw up an enticing or agonizing challenge to each judge: of locating himself or herself as the upholder or transformer of established norms of interpretation or enforcement of law. I have one last point. A changing world has made globalization an unavoidable necessity. This, in the ultimate analysis, cannot be restricted to economics and trade policy only and extends to global standards in all fields including in the area of dispensation of justice; by implication, the space for local peculiarities is shrinking. The sooner we adjust to it, the better for all – litigants, lawyers, judges. The eventual beneficiary would be public. Thank you for giving me the opportunity of sharing some thoughts with you today. I wish you all success in the years to come.